How many LEGO bricks does it take to build a larger-than-life bison? An exhibition running through January 5 at the North Carolina Arboretum has the answer: 45,143. “Some Assembly Required: The LEGO Brick Sculptures of Sean Kenney” features 27 large sculptures, all crafted from your average LEGO pieces. But Kenney’s detailed and fun works are anything but average. In his hands, a ruby-throated hummingbird hovers eight-feet in the air above a billowing bloom; a blossoming rose rises to seven feet; and a bright green frog the size of a cocker spaniel gazes serenely from a large lily pad. The arboretum worked for weeks to find a home in the landscape for each figure and came up with a design that will delight visitors as they walk through the gardens. Kenney, who describes himself as a 37-year-old “professional kid,” is one of 12 LEGO-certified experts worldwide licensed to create commercial pieces with he blocks. He works with a team out of a studio in Brooklyn, New York, crowded with bins of bricks sorted by color and shape. It can take weeks to complete a single sculpture. On November 23, LEGO fans can meet the artist, who has also penned a series of LEGO-themed books, and glean construction tips during activities. 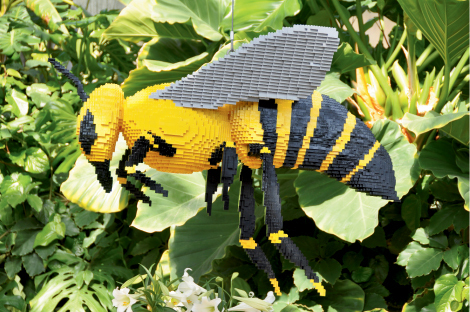 Visitors can check out entries from the nationwide 2013 LEGO Brick Competition. It’s plenty of inspiration to get building.